Premier Grid provides a beautiful, finished appearance and is functionally unsurpassed. This unique open-weave, grid-rib design, with 1.1875″ wide carpet strips, creates an entryway that is high on style yet low on maintenance. Premier Grid is engineered to withstand heavy foot and wheeled traffic more efficiently than alternative matting systems. Now available with the TACFAST backing system as an upgrade. DIVIDER: Use for applications that require the grid to be separated from another product. 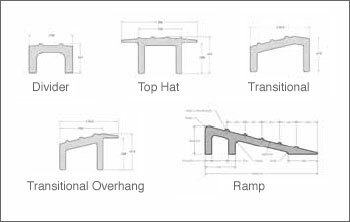 TRANSITIONAL: Use in conjunction with the Transitional Overhang or TopHat. Designed to go from the grid (1/2") to a product that is 3/8" in thickness or a recessed well that is 3/8" thick. TRANSITIONAL OVERHANG: Use in conjunction with the Transitional divider. Can also be used on its own to reduce the grid to 3/8" thickness. RAMP: Use for Surface Mount applications.